We’d love your help. Let us know what’s wrong with this preview of The Invisible Mind by M.T. Bass. To ask other readers questions about The Invisible Mind, please sign up. I began The Invisible Mind the third book in M.T. 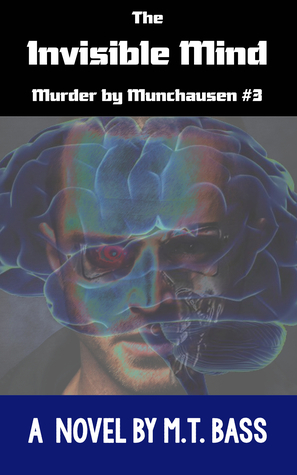 Bass’s Murder by Manchausen Mysteries, with a beating heart drowned in a tornado of conflicting emotions. It is mostly as a result of the events that transpired in the last pages of The Darknet, the second book in this futuristic technothriller mystery series that ends on notes that leave readers itching to find out what happens next. Jake, the Geek Squad cop and former partner of Maddie, a homicide detective, is in a coma where he remains among I began The Invisible Mind the third book in M.T. Bass’s Murder by Manchausen Mysteries, with a beating heart drowned in a tornado of conflicting emotions. It is mostly as a result of the events that transpired in the last pages of The Darknet, the second book in this futuristic technothriller mystery series that ends on notes that leave readers itching to find out what happens next. Jake, the Geek Squad cop and former partner of Maddie, a homicide detective, is in a coma where he remains among the living due to machines. The patient lying next to a comatose Jake dies. Amy, a little girl, is shackled to a metal bed frame somewhere. Sitting with Maddie in a deli, Jake’s partner EC gets a call from a fellow Geek Squad member called Q. Jake, meanwhile, drifts through his own subconscious. The Baron, the serial killer capable of reprogramming synthoids to kill, or, Manchausen his victims in the same way that former and legendary serial killers like one Richard Speck did, is still out there, having the little girl Amy shackled to a bed. When Jake begins recovering, Maddie gives him some evidence to go through. The Baron might be the Geek Squad’s primary concern, but there is another mystery. A machine that has responded to a synthoid video stream of one of the Baron’s murders with emotions. The only place that Maddie feels safe anymore is at Cutty’s Deli. Owned by her godfather Cutty, it is a place of pleasant memories revolving around her childhood, her father, her career choice, and Jake. She still does her job as a detective and she doesn’t let this fear get in her way, but while everything is slowly returning to normal, particularly seeing as Jake comes out of his coma, a paper left in the public for her eyes only makes fear creep back into her. Having had a relationship with Jake before, these two can be seen making love, but what that means is a question that is difficult for me to answer because they are more like former lovers who aren’t in an official relationship, but rather, if the opportunity should come along and if the circumstances are right, they’ll take it. First on the menu of famous murder cases for the Baron to reinvent is that of Richard Speck’s. This is a big one. Includes nine victims in total. And it differs from the original Richard Speck murder because there were eight victims, and Speck was caught because what he didn’t realize was that someone had been present as he murdered the eight. So why would the Baron kill nine in total instead of killing eight and leaving one alive if what he had been doing all along was recreating old murders? “It may be evil, but our day job is crime solving, not soul saving, and we got bodies stacking up as deep as snow in Buffalo.” This from Lt. Sands after asking Jake, while enjoying scotch in his company, how Maddie is doing and if the hunt for the Baron – a hunt that has become nothing short of a race against time - is going to get more complicated. Jake responds by telling Lt. Sands that the bodies are just theater furniture props and not part of the actual plot. Lt. Sands goes on to warn Jake not to repeat those words again. Even with the Ghost Squad’s Q making some progress towards finding the Baron in the Darknet, he’s still out there, sending his robot puppets to kill people. Jake suggests that they hunt the Baron down the old fashioned way, which is at least understandable considering the difficulty of finally getting the Baron in cuffs. Science is not a human invention governed primarily by good or evil because, as the author writes, “… evil innovates too, and the same features that made synthoids even more human-like in their behavior also helped create robotic assassins which could better camouflage their malicious intents and evade the reach of the Artificial Crimes Unit by melting into and moving undetected through the humanity that surrounded them.” What makes the Baron so dangerous is that the synthoids he uses for his murders can come from anywhere. He even uses a female synthoid originally programmed for surveillance and child care assistance. As I got to the final chapters, I was glad that Bass had something to offer in the way of letting me know what kind of mind the Baron had exactly. Though his manipulation of his robot killers certainly makes him a puppet master, he is not a mad man who likens himself to being a god. Instead, he calls himself a lowly agent of change. In two instances, the Baron would compare himself to be similar to Amy, the orphan girl he kidnapped along with another Amy, the blonde waitress Jake was known to sleep with. When comparing himself to Amy for that second time, I would wonder what it was that the Baron actually meant that he and Amy were similar since he wouldn’t come out with it right away. The Baron is out there and the Geek Squad needs to step it up to catch him. Jake is in a coma, Maddie is still having issues after her attack, and now there is a hostage, Amy that seems to have some relation to The Baron’s past. But the most shocking is an android showing emotions when watching a video. The real question would be how the emotion android and The Baron related and if that will help stop him. After the ending of The Darknet I couldn’t grab The Invisible Mind fast enough. Jake starts The Baron is out there and the Geek Squad needs to step it up to catch him. Jake is in a coma, Maddie is still having issues after her attack, and now there is a hostage, Amy that seems to have some relation to The Baron’s past. But the most shocking is an android showing emotions when watching a video. The real question would be how the emotion android and The Baron related and if that will help stop him. After the ending of The Darknet I couldn’t grab The Invisible Mind fast enough. Jake starts out in a coma but as he recovers Maddie brings him case information to review. Of course you have famous serial kills being copied but The Baron changes the outcome of Richard Speck’s killing and it makes you wonder why. But the thing that really got me about this story was The Baron. We learn more about him and find out he is not just some typical madman hacker or thinks of himself as god. This adds another dimension to this story and just amps it up that much more. I love this series and see that a fourth book is expect to come out. I couldn’t read The Invisible Mind fast enough to see how Maddie, Jake, and Q are going to stop the virus. Now I am very curious at what challenge they are going to face next. Make sure to get your hands on a copy of this series. Every author was first a reader. My aim is to pay forward at least some small portion of the fun I've had and the discoveries I've made from reading great books, holding fast to the notion that while victors may get to write history, novelists get to write/right reality. To join my mailing list and keep in touch (and get a free download), click here. Just so you know what you might be getting into, Every author was first a reader. My aim is to pay forward at least some small portion of the fun I've had and the discoveries I've made from reading great books, holding fast to the notion that while victors may get to write history, novelists get to write/right reality. As a reader, I launch campaigns for myself. I'm currently coming to the end of reading biographies of every U.S. President in chronological order. Next up, I think, will be a meandering read through of the history of aviation from the Wright Brothers to the present. Of course, if something shiny comes along — like a new release by Carl Hiaasen or Erik Larson — I might get distracted for a bit. As much as I love real, physical "meatspace" books with real paper pages ("Real tomato ketchup, Eddie? "), I have to confess that eBook publishing has not only enabled my story-telling disorder, it has amped my reading back up without breaking my back, since I can carry my entire library around in my iPad Mini.